There are multiple free parking lots in King of Prussia Town Center. 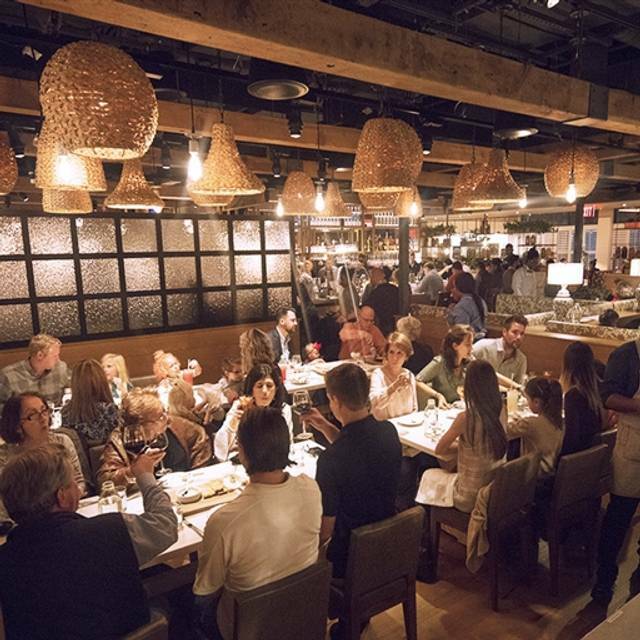 Founding Farmers King of Prussia, offers a beautiful, intimate private dining, the General's Parlor, for all your special celebration or corporate meeting needs. Available to reserve all week days and weekend evenings. 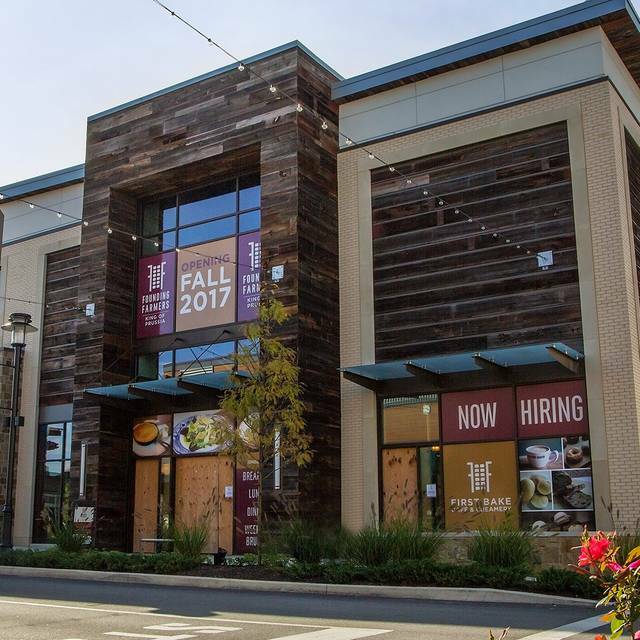 Located in the lively, new King of Prussia Town Center, Founding Farmers KOP is a full-service restaurant and bar open seven days a week serving breakfast, lunch, dinner, and our Farmers Market Buffet Brunch on weekends. 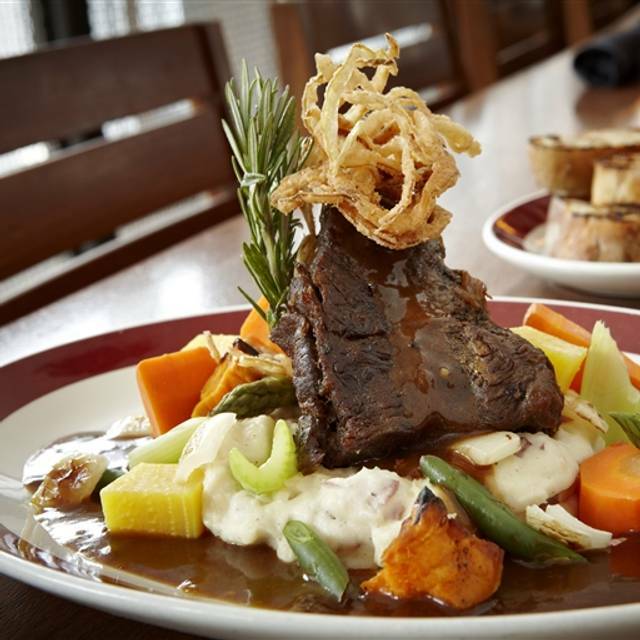 As a farmer-owned restaurant, almost all of our delicious food and drink – from our freshly baked bread and house-churned butter to our craft cocktails with our proprietary spirits – is made from scratch, using high-quality ingredients from American family farms. Our First Bake Cafe & Creamery located just downstairs will be serving light fare, coffees and scratch sodas, fresh baked breads, donuts and pastries, and our famous homemade ice cream, all available to go or for enjoyment at our counter or one of our cafe tables. 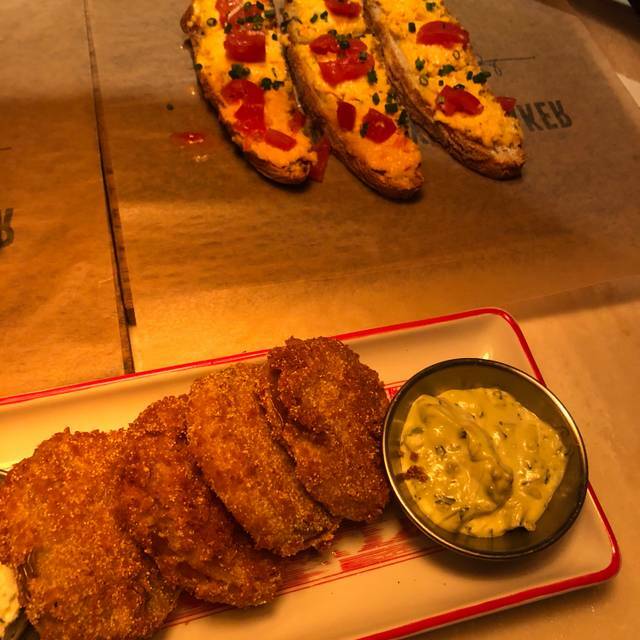 We are excited to be making our way to Pennsylvania and hope our guests will enjoy all that is Founding Farmers. Our server was not the greatest we've had. 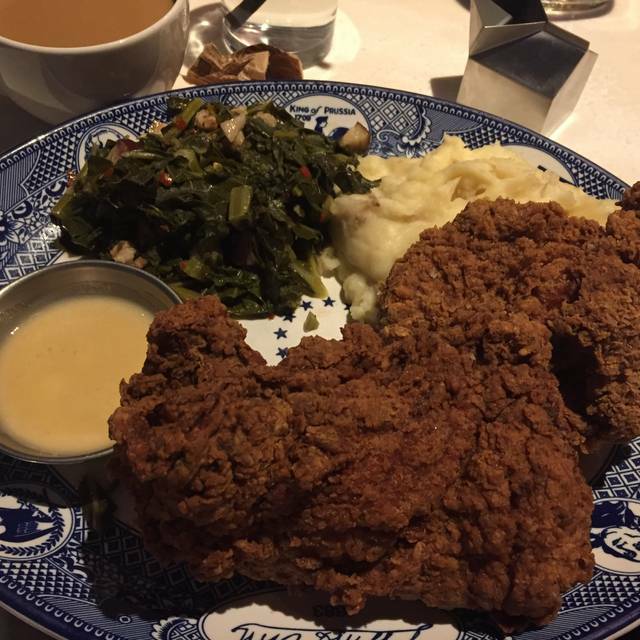 Food was good as always, but service can make or break a place for me. And this one broke it. Booths are best. The food and service are wonderful.. don’t miss their BRUNCH. It was our first night out as new parents with our baby boy and it was also my sisters birthday. Our food arrived late and was cold. We didn’t have time to wait again for more food because we are all on a time clock with our babies. It was a terrible experience for what was supposed to be a special occasion for everyone. It’s unfortunate, but I would not recommend coming back for our family. OMG!!! This place is absolutely amazing!!! Now in my top 3 restaurants!!!! My husband and I have been to Founding Farmers several times. We love it there. Our favorite is the impossible burger. It is a great option for those who want to go meatless. 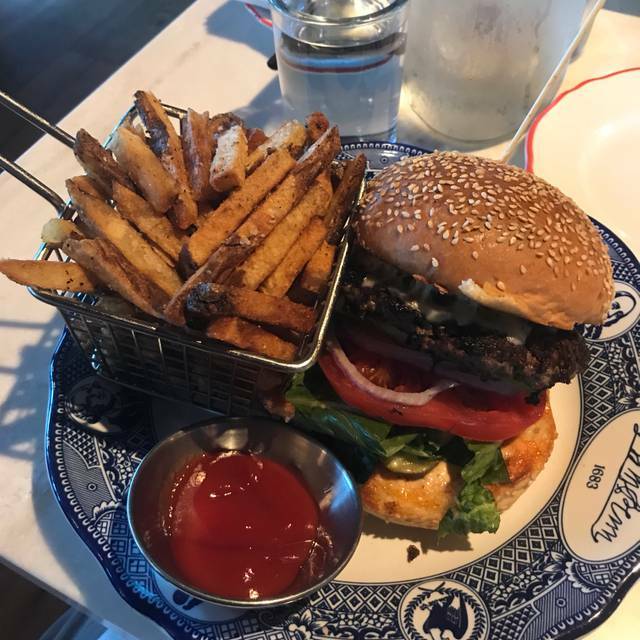 One of the best veggie burgers I've ever had! Food variety and the quality was delicious. Giving a lower ranking due to the fact it was EXTREMELY crowded and busy.. and also parking at this location is a nightmare. This brunch used to be amazing. Today there was about 2/3 of the usual selection and they pared down the passed items. Eggs Benedict was cold, even straight from the kitchen, salad was soggy and the iced tea was meh. Our waiter was awesome though and it’s a great space. The wait times even after a reservation are obnoxiously unpredictable. The servers are cordial, but they don’t show up much during your time here. We paid for a dessert once and it took so long that we had to leave without having it! Waited 35 minutes to get seated even with our reservation. Food was OK not sure it was worth the wait. We checked in with the hostess 15 minutes prior to our reservation and were told our table was being cleaned off and we would be called to be seated shortly. 50 minutes later, I asked why we were still waiting and was told that there were numerous tables that had paid their bill and staff was just waiting for them to leave so they could be cleaned off and we would be seated. It took another 15 minutes before we were taken to a table. Once at the table, we were promptly greeted by our waiter, that was the only time we felt as if our business was appreciated. The food was very good and the serving sizes plentiful however, the staff and management did not seem to think there was any need to please the patrons in terms of service or accomodation. If the restaurant is at capacity, you should inform those waiting that this is the case and let them decide to wait or go somewhere else. I believe that common courtesy and honesty would go much further to gain repeat business than the appearance of greed and being mislead. If we had been told our wait wait was going to be 45 minutes, we would have been much more receptive to that than being lied to. Even with a reservation there will still be wait times. Overall excellent experience! The food, waitress and manager were very nice. The bartenders definitely know what they're doing! However, we sat down an hour and a half late. The check-in process and lobby area is a real challenge. Too many people in too small a space. Absolutely terrible night . I booked a table for 6 to celebrate my birthday two weeks in advance of the date . We were initially shown to a bar table set for 5 and truly only sat five ... the noise level was crazy we could not hear the waitress or see the menu as it was so dark . We asked to be moved and were initially told no by the waitress. When my husband asked to speak to the manager we were moved to a table the same size as the previous one in the bar area also still way too cramped for five . The appetizers took forever to come out but once they did almost all of our food did .. entrees included which made it very tricky given the space issue !!! extremely disappointed on a night meant for celebrating . We will never go back . Service was slow but they were very busy. Food was good but not worth the price. 1. They charge you for the bread that usually comes free in other restaurants. We paid $5 for the bread and it looked fantastic but ultimately was just very plain white bread, nothing about it justified the cost of it considering other restaurants give you free bread that is in many cases much better. Yeah, so they bake it in house, great. I didn't have a problem with the free bread I usually get in other places though. This didn't justify a cost. 2. My wife's food was way over-salted. She didn't even finish her dish because of how salty it was. 3. The entree portions were horrible. I got the herb-roasted grilled chicken with broccolini and string beans. There had to be literally 6 string beans there. A decent amount of broccolini but I had one piece that I simply couldn't chew, i had to spit it out. The chicken (which was perfectly cooked, seasoned, and tasted fantastic) was barely there, it looked like a few chunks of chicken cubes on top of my greens. Like something I'd overpay for at a frou-frou restaurant. We were hungry not long after dinner, which was a downer. That dish cost us $16...for THAT. 4. The mac and cheese, which is allegedly made "in-house" and based on recipes from a founding father, looked like death warmed over and tasted bland actually. I guess mac and cheese sucked in colonial times? Go to Panera Bread and get better mac and cheese. 5. The staff was friendly and helpful (aside from not really asking us how the meal was). 6. The decor and ambiance is really awesome, I loved the farm-y look of everything. However, in terms of the food, this place is all dressed up with nowhere to go. Really wanted to like this place. Especially since we broke tradition and went here instead of going to Seasons 52. BIG MISTAKE. This is not in the same universe as Seasons in terms of....ANYTHING. Except at Founding Farmers, you pay a lot of money and get poor food. Extensive buffet and passed foods as well as made to order foods all included in the all you can eat buffet price. A little steep, but worth it due to the variety and quality. Definitely would go again. Loved that it had a little bit of everything and great ice cream and donuts for dessert! We came in for a very late supper after singing in a concert, and had one of those "Murphy's Law" nights: after wrestling themselves over two options for a considerable amount of time, one guest opted for chili -saying they hadn't had good beef chili in decades. Order in...time passes...waiter comes back, very apologetic, saying the chef didn't feel right about the smell of the chili, 86ed it, please choose something else. Which is exactly how I want someone making my food to behave! Ok -next choice, obviously delaying some of our food. Three other dinners are delivered, this time the perogies were served fried, when she ordered boiled. We opted to keep them as we were all too hungry to wait, but the manager graciously took them off the check. Also, the music was a little loud for my husband's liking, and when asked if there were a quieter section, the hostess said, sadly not, but she'd be happy to lower the music a bit. Gotta say, this almost never happens and it made for a much happier meal. So while things went off the rails, everything was handled promptly and cheerfully and is simply one more reason why I adore this restaurant. Party of 5 seated promptly. Waiter would disappear for long periods during our meal. Four entrees were horrendous unless you enjoy your food criminally oversalted. Only good outcome is I know never to dine here again. Oh, forgot to mention the ridiculous markup on their wines. For a moment I thought I was at the Capital Grille. Wishful thinking. Very crowded standing at the top of a large stairwell and set of steps. The flooring is tile. It had rained that night making it slippery. Menu was fair. The server was great. But, can't remember his name. Absolutely perfect! Great service, great restaurant, and great food!! Wish there was one in Pittsburgh. We made reservations (for three) for lunch and had to wait 30 minutes while others with no reservation were seated right away. 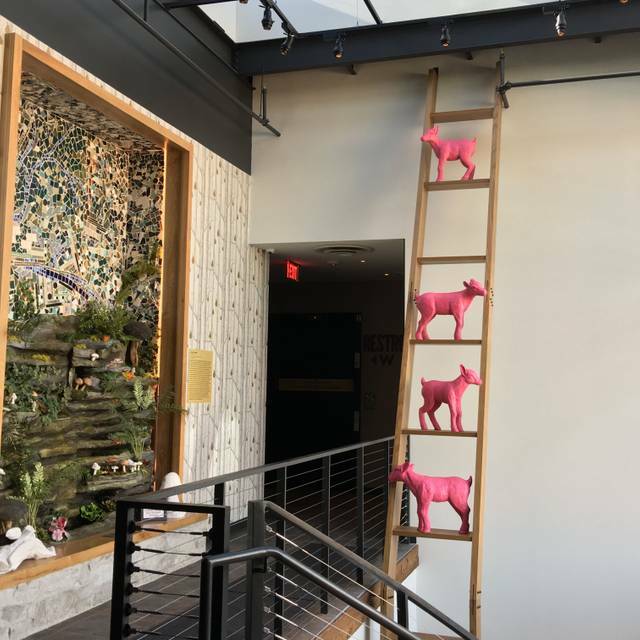 This was my first time here and I usually get a little miffed when something like this happens, however, once seated and food arrived, wow!... the quality and taste of the food was outstanding. So, although my first impression was tarnished by the start of my visit, I was a very happy diner by the time I left. I will definitely return when I am in the area. Great waiter! Food was fabulous! As usual, Founding Farmers did not disappoint! Creative and delicious drinks, followed by outstanding food. Had the scallops for the first time, and will definitely order them again! The food is phenomenal and the service is outstanding!! Christian was our waiter and he gave us his personal recommendations as well all of the donut choices!! Too many to choose from. The food was delicious. We sat at a booth off of the bar area, and was very happy with the noise level. The staff was very attentive and did a great job. 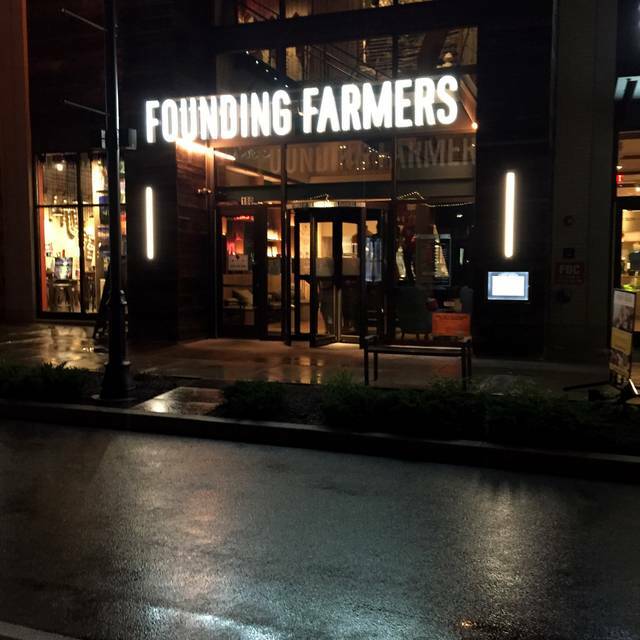 Founding Farmers has great food and customer service. Highly recommend Founding Farmers. Food was excellent and staff was very nice. The food was dry. All 4 of us had the same experience with our various dishes. I ordered chicken enchiladas and the tortilla was so hard (dried out from sitting under a heat lamp maybe) that I couldn’t cut it w my knife. Had to pick it up to eat it, and there was maybe a tablespoon of chicken filling in the enchiladas. The only good part was the pretty restaurant itself and the really good cocktails. If you are going for a meal though I would not recommend this place. I ordered the yummy barbecue pimiento burger. I had it before but this time no sauce and barely and cheese. The Server even knew it was done wrong. Huge breakfast brunch, lots of choices but nothing was hot that was supposed to be hot. Didn’t matter if it was on a warming tray still not hot. There was a nice variety of foods. However, line was long for the buffet and it is very noisy so hard to talk. A woman slipped and fell on the wet floor right near my table and they quickly put up their caution wet floor signs. Fortunately, she was not hurt. I would recommend it if you are not trying to have a significant conversation as you are seated very close to neighboring tables. We enjoyed the food, especially the ice cream with all kinds of toppings. I think children will be able to find things to eat like ravioli, French toast or eggs. It was great as usual! The only concerning incident that occurred was seeing a patron slip and fall on the dining room floor! The tile is very pretty, but slippery! Four of us went to Sunday brunch. The server was very attentive, the brunch was very well set up and the food was superb. 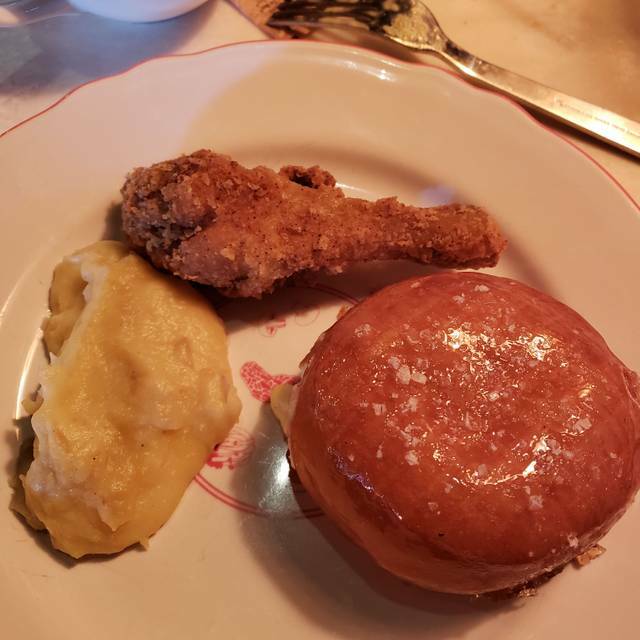 My favorite was the fried chicken, as the breading was very light and the french toast had a wonderful cinnamon flavor and deep fried to perfection. It is great to go to a restaurant where you can get excellent food that you would not make at home.